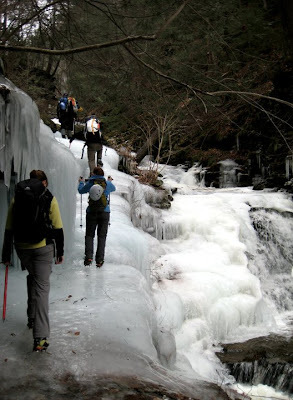 The familiar Falls Trail, completely covered in ice! I can't remember how I spent the first day of 2010. According to my Google calendar, I went skiing, but given I don't remember a thing about the day, it obviously wasn't memorable enough. The first day of 2011 was a different story, and after a day on icy trails in Northeast Pennsylvania, I have a feeling I'll remember this one next year. After spending New Year's Eve with friends, I went to sleep with my alarm set for 7am. I hit snooze at least twice, realized our 7:30am departure deadline was looming, and rolled out of bed both cursing and admiring those who have a knack for real alpine starts. Our plan was to welcome 2011 with open arms - arms holding ice tools. Friend Patrick organized a small group hike, complete with ice route scouting, in Ricketts Glen State Park. My first cold weather trip there was on Valentine’s Day last year for a guided ice climbing trip. I never imagined I’d be back with friends hoping to climb on our own, and capable of doing so. Ricketts Glen is notoriously icy during the winter. Parts of the trail, which winds through a series of waterfalls, are completely covered in feet of it. Warning signs at the trailheads tell visitors that the park is closed during the winter to all except registered ice climbers and experienced, properly equipped hikers. Our crew on New Year's Day. It was a perfect start to 2011. We took the Falls Trail from the Rt. 118 parking lot up through Kitchen Creek without incident, passing three waterfalls (Murray Reynolds, 16’, Sheldon Reynolds, 36’, and Harrison Wright, 27’) before breaking at Waters Meet. 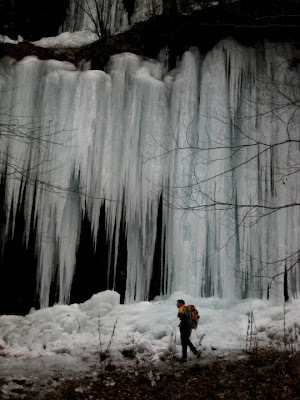 Continuing up the west branch of the Falls Trail, we encountered exactly what we’d come for - a whole lot of ice. Each of us came prepared with crampons and ice axes, though we’d passed a handful of folks on the trail who seemed ill prepared. Climbing and traversing thick sheets of ice, I marveled both at the formations themselves and how vulnerable walking on them made me feel. Before reaching Ganoga Glen and the park’s tallest waterfall, one of the couples we’d seen earlier passed us heading back down the trail. The man looked as though he’d fallen, face bloodied and scratched, completely soaked, but otherwise alright. They’d tried to traverse the icy parts of the trail without proper gear, and considering what the outcome could have been, he was lucky. After offering help, we all moved on. Patrick scouting ice next to Ganoga (94'). 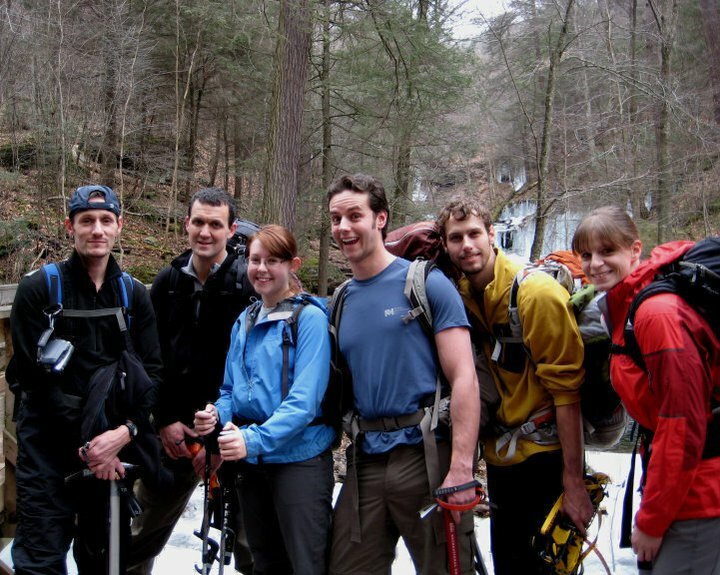 We’d hoped to find climbable ice near Ganoga (94’). Unfortunately, several days of warm temperatures left the falls exposed and the area generally unstable, albeit breathtakingly beautiful. We crossed the creek to scout the east edge where huge pillars form from runoff and spray. I had an uneasy feeling about trying to climb there; everything seemed to be falling apart. But I get that uneasy feeling a lot – it’s fear – and I pushed it away. After some in the group suited up and Patrick went to see about setting up ropes, we heard a giant crash as one of the pillars out of sight above us collapsed. Blocks of ice, one the size of a washing machine, tumbled down near where we stood, adding to a pile another hiker warned us was the result of a pillar collapsing shortly before we arrived. We took the hint and packed up, retracing our steps back to Rt. 118. I was glad to see some hikers with Yaktrax, and others who’d turned around after reaching particularly icy spots. I couldn’t imagine trying to hike as far as we did without crampons. Of course, as soon as we took the crampons off and reached the flattest part of the trail, I managed to slip on a small sheet of ice and slide partway down the trail in front of a family with two toddlers. The kids thought it looked like and went to do the same thing. If their mother is reading this, I apologize! All in all it was a perfect day. Though we didn't get any ice climbing in, we saw some incredible ice formations, stayed safe, and spent the first day of 2011 with wonderful friends. But it was also a reminder to be prepared and pay attention to your surroundings. What are some of your favorite winter hiking tips? 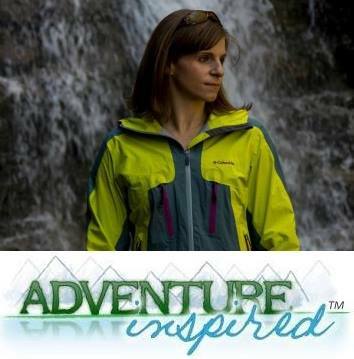 Even been to Ricketts Glen or a place like it in the winter? Having something warm, tasty and preferably sugary to sip on and feel warm on the inside goes a long way to making a cold day out on the ice enjoyable. And I have these gore-tex, primaloft mittens that are super warm to begin with, and I always have them in my pack. But if I know that it's really going ot be cold, then I will take hand warmers and through them in each mitten, then toss the mittens in my pack. That way, anytime I wan, I can just pull them out, slip my hands in, and instant toasty goodness! Lastly, a good down parka to keep you warm when not climbing is clutch. Staying warm when climbing is the easy part. It's hanging out or belaying that makes you cold. Hot drink, warm mittens and a puffy jacket seem to be the magic trifecta to solve that. wow, good thing you didn't set the ropes! yikes! wiping out in front of the fam sounds like something i would do! too funny!